Kavita Burumle (not her real name) spent two years in coaching classes in Kota, Rajasthan, preparing for medical competitive examinations. She comes from a small rural town in Maharashtra and hence stayed in a hostel in Kota. Unfortunately, despite spending two years and substantial money in these coaching classes, she could not get into any decent medical school. Her days in coaching classes and self-study used to start from 6 a.m. and end around 9 p.m. Similarly, before she came to Kota, her parents would send her to private tuitions in her home town which were from 8 a.m. to 10:30 a.m. Her regular school started at 12 noon and finished at 6 p.m.
She had no time to play and this focus on competitive examinations robbed her of her childhood. Children all over India go through this grind year after year and for what? By creating a whole generation of uni-dimensional citizens we are playing with fire. This is not the only way for children to excel. There are other models of children's education which give well-rounded education. Such models exist all over the country but are few in number and need to be replicated. I will describe our small experiment in this area. When I and my wife came back in 1981 from the US to stay in a small rural town of Phaltan in Maharashtra, there were no good schools. Hence when the time came for our daughter's education we helped start a Marathi medium primary school and then a high school for them. Thus whichever class my elder daughter went into, the school added that. The basic premise of our school was to give a good all-round education. So there was ample time given for outdoor activities and other creative activities like arts and crafts. Also, attending extra tuition classes was not allowed by the school. In the initial stages it was very difficult to get students because parents were horrified at the thought of sending their children to a school which did not focus on competitive examinations and cramming for the students. The principal, who was an American but naturalized Indian citizen, went from house to house requesting the parents to send their wards to our school. After our elder daughter got quite good marks in the state secondary board, the Phaltan residents woke up to the value of education in our school. And when our younger daughter got a position in the board, then suddenly people realized that it is one of the best schools in town. Today for 25 or 30 seats, we get around 150 to 200 applications. Our children benefited greatly from this school and education. Our elder daughter went to do her Ph.D. in mechanical engineering in the US and is at present a researcher in a major US company. Our younger daughter did her Masters degree in education from the Tata Institute of Social Sciences (TISS) and now teaches in our school. 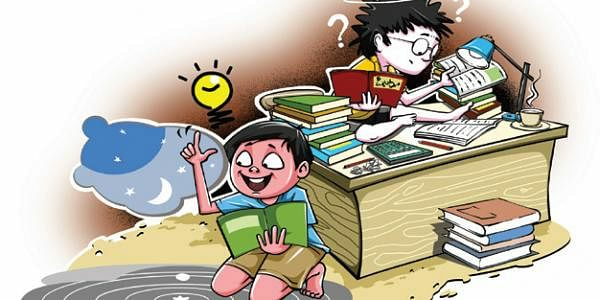 Most of the schools put a tremendous burden on the children to study for competitive examinations so that they do not have any time to play. Children are attending one class after another from morning till night. This robs their childhood and in the process we are creating a whole generation of extremely focussed children who only know how to react to the pressures and inputs and have no time and inclination to think, reflect or get involved in any other creative activity. Besides, they are constantly in fear of failing or missing out on passing the competitive examinations. Thus we are creating a whole generation of Indians who start their life with fear. This fear creates life-long psychological knots and mental problems and in extreme cases leads to suicides that we witness with increasing frequency. Also, as children they would like to play and indulge in childhood activities but because of pressures of the parents and the school, they start telling lies to hide these activities. Inculcating the telling of lies in our children is the biggest tragedy, and this habit, learnt during the formative years, continues throughout their lives. This habit then gives rise to irresponsible behaviour and subsequently leads to corruption. Also, hardly any school curriculum has courses on moral science or on how to become good and responsible citizens. Hence, we are creating zombies who hardly learn any skills and are focussed only on passing exams and nothing else. It is also being increasingly observed that most of the students, after passing the entrance exams and entering into IITs, medical schools and management institutes, do not know very much about their subjects, but mostly excel in how to pass these exams. With the present quality of teaching, even in some of the prestigious colleges, leaving much to be desired, we are raising a whole generation of engineers, doctors and others who are very inadequate in their professions. This does not bode well for the country. Also, because of the focus on cramming for exams, children never learn to think independently and to develop curiosity. This is carried into their professional education and hence we are hardly producing any researchers or thinkers in the areas of science and engineering. So what is the remedy? We need to increase drastically the number of educational institutes in every sphere; give autonomy to them; have a good national watchdog for maintaining the quality of education and create one examination board for the whole nation. Besides there should be compulsory subjects taught at all levels on humanities, social sciences and how to become good citizens. Let a thousand flowers bloom in children's education. Healthy competition and demand for good schools will automatically lead to excellence so that we can help produce students who are able to think independently and are curious about everything around them and in their life. Besides, we also need to create avenues for gainful employment for children who want to do things other than engineering and medicine. All these efforts will take a long time to show their effect and hence the reforms in education need to be done now for the future betterment of the country.